RB Landscapes has again been recognised by the Landscape Industries Association Victoria (LIAV) at their annual 2009 awards ceremony with a quintuple water feature receiving top honours in the best ‘Feature in the Landscape’ category. Up against a number of high profile garden designer finalists, the RB Landscapes water feature drew praise from the judges for its simplicity of design that successfully camouflaged a complex project within a small courtyard space. The success of this landscape project is due in part to the clever use of vertical space within a narrow strip of land at the rear of the property. Five sheets of framed corten steel are staggered along a thin garden bed to create a giant louvred effect, while tall and lush bamboo spires cast the eye upwards and screen off any neighbourly distractions. The other remarkable element to this project is the sheer scale and practical design of the water feature which includes five full-height sheets of corten steel – each cascading a gentle trickle of water drawn from two water tanks beneath the courtyard deck. Clever plumbing enables the garden to be watered by the water feature and, when not in use, this maintenance free system returns the water back to the below-deck holding tanks. Strategically spaced to screen out an otherwise mundane garden fence, each corten piece towers above the courtyard adding a rustic and earthy charm to this outdoor entertaining space. “Our client wanted a private outdoor space to retreat and unwind,” said RB Landscapes owner Richard Bellemo. The annual LIAV awards have proved to be a successful event for RB Landscapes having received two major accolades at the 2008 ceremony. Taking out the Best Residential Landscape < $50,000 and Best Residential Landscape $75,000 - $150,000 titles in one year, the RB Landscapes team were overwhelmed by the achievement and the national media interest that followed. 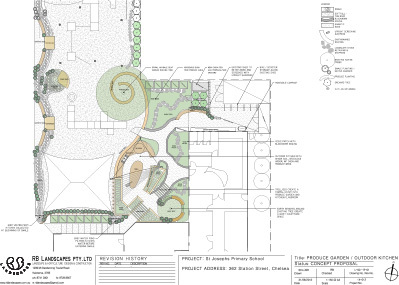 “We work hard to push the envelope with garden designs and are amazed at how the local and national landscape community has embraced our work,” said Richard Bellemo. The LIAV judges drew attention to the striking appearance of the water feature and the secluded feel of the outdoor room. A closer inspection of the water feature construction revealed how complex a project it was and how the simplicity of design successfully masks the difficult nature of the build. 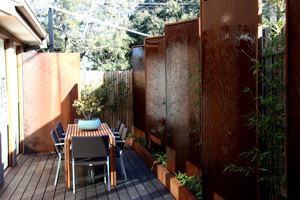 RB Landscapes is a Melbourne-based, multi-award winning landscape design and construction business which began in 2002. Specialising in creating landscapes that imitate nature, owner Richard Bellemo draws inspiration from natural environments experienced both around Australia and overseas.